Bogong Blog - Which is the best down sleeping bag? Scenario 1. General use three season bag. Scenario 2. ‘Serious’ bushwalking bag. Scenario 3. Snow camping/winter sleeping bag. Scenario 4. Mountaineering sleeping bag. Scenario 5. Lightweight at all costs! Scenario 6. Ultralight bag that is still comfortable. Scenario 7. Budget three season bag that will be used and abused. Scenario 1: General use three season bag. Good for bushwalking, travel, camping. The Mont Zodiac 500 is one of our most popular bags, and it’s not hard to see why. It’s a comfortable, quality down sleeping bag from an Australian company. Full length zips on the side and base mean it can be opened out as a doona, making it versatile enough to deal with crashing on a friend’s couch as well as a bushwalk down the Prom. This is a quality sleeping bag at a very reasonable price. Available in standard, XL (long) and women’s (short) sizes. Also consider: Exped Comfort 400, Mont Zodiac 700 or 350. Scenario 2: ‘Serious’ bushwalking bag. You’re pretty into outdoor activities, and you’re not going to cancel your next trip just because it’s snowing, or stay home just because it’s -2 in Grampians. You need a serious sleeping bag. The Mont Brindabella is warm and versatile. 700 grams of quality 785+ loft duck down keeps you toasty warm, while the Hydronaute XT outer shell protects your sleeping bag from condensation, snow and wet gear. The down is DWR treated too, for ultimate protection from moisture. But when you’re heading off at other times of the year, the full length side and foot zippers mean you can vent as required, making the Brindabella a versatile option for serious bushwalkers. Scenario 3: Snow camping/winter sleeping bag. The Exped Waterbloc 800 features fully welded waterproof seams. Check out this outrageous video! Ideal for snow camping, winter bushwalks and ski tours where everything gets wet in the end! For these kinds of trips, it’s worth taking a bag that’s a bit warmer than you need to allow for the effects of moisture (as I found out the hard way on the Western Arthurs). A boxfoot or mummy style bag is the most thermally efficient in winter conditions. The Mont Spindrift and the Exped WB 800 both feature top quality goosedown with a mummy shape and waterproof shell fabric. Scenario 4: Mountaineering sleeping bag. When it comes to choosing a sleeping bag for mountaineering, it's best to chat to one of our expert staff about exactly where you're going, so that we can determine the exact sleeping bag that would be best suited for you. In general, you want a very warm sleeping bag, with high quality down. The down in the Mont Main Range sleeping bag is 850+ loft and has a down fill weight of 950 grams. The down is also DWR (Durable Water Repellent) treated, which stops it from clumping when wet and helps it to dry quicker. In addition, it has a Hydronaute XT outer shell that reduces water ingress in the first place and helps trap warm air. Mont's clever construction, where the torso baffles run the length of your body instead of horizontally, also means that down doesn't shift off your body like it can with horizontal baffles. The warm, comfortable boxfoot design is also good for cold weather. With a minimum comfort temperature of -24 degrees Celsius, this bag suits extreme cold conditions and use in the world's great ranges. Scenario 5: Lightweight at all costs! You want a light pack, and you’re willing to sacrifice a little convenience to get it. 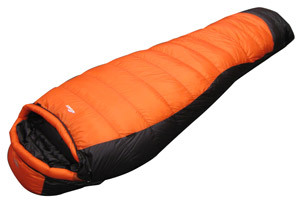 The Mont Zero UL is an incredibly lightweight down sleeping bag. It's perfect for summer cycle tours, hikes and camping when it's not too cold. 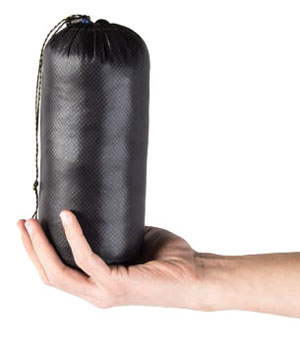 It's a tiny 300 grams, and packs down into a unit that's barely bigger than a one-litre Nalgene bottle. It has a minimum comfort temperature of 7 degrees. This is achieved by using top-notch duck down, ultra light fabric, and a tapered mummy shape. The lack of a hood is a price you need to be willing to pay for the weight saving. Scenario 6: Ultralight bag that is still comfortable. If you want a lightweight sleeping bag without the sacrifices, the Mont Helium 300 is the way to go. 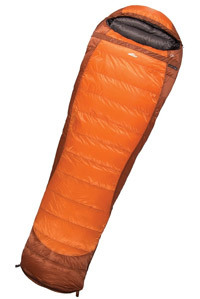 It includes many of the features that are missing from other ultralight sleeping bags, such as a full length zip and bottom zip, down-filled baffles along the zip and hood, and a generous hood. All this at only 700 grams 640 grams! How can it be so light? Two reasons. One is the ultralight 15 denier 10 denier fabric which cuts the weight of the shell dramatically. The other is the 800 loft down. This incredibly high spec down gives you more warmth for the same weight, cutting down on the total weight of the bag! Update Feb 2016: The Helium 300 is now 60 grams lighter thanks to new 10 denier fabric, and it features DWR down for improved performance in damp conditions! Scenario 7: Budget three season bag that will be used and abused. If you're just looking for a sleeping bag to take camping, cycling or maybe to a festival, the Rock Empire Cyklotour is a good option. As a synthetic sleeping bag, it is a good value option, and much easier to wash than a down sleeping bag. The main drawback is the size and weight, although this is not as bulky as many cheaper synthetic sleeping bags out there.